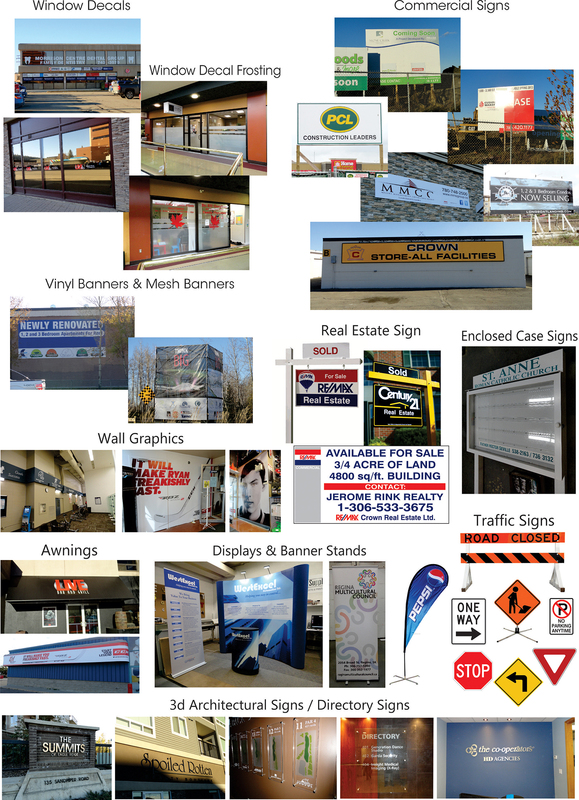 Do you have a company, a hypermarket, bank, church or a retail shop that you have ever thought of putting up a sign for? Regina Signs Company can do it for you because we have experienced specialized personnel in fine art and design. The skilled personnel are highly trained to put up both interior and exterior signs. We also have a wide range of different signs which means you will never have to look for someone else to complete the work. The company works on a tight schedule to complete its work on time and the main goal is to deliver our services keeping in mind the client’s satisfaction. Our services can never be disputed by other sign companies so take the opportunity and try us. In the free market we realize there are a variety of commercial signs starting from your retail shop, banks, in special events like wedding ceremonies or celebrity shows, in the clubs and government institutions. A sign at your company door step will require a few pennies depending on the material, calligraphy used, size of the sign and font used. A stunning sign for commercial purposes should always match with the color along other previous graphics and style. For instance, a business name will only cost a few bucks to print and install in your business but the choice of installation will depend on the client. Special event signs are accompanied by some decors to increase the quality. The method of applying for a sign in our company will need relevant and direct information about the type of sign you require. The process is very simple with only a few steps of acquiring necessary documents. First approach our customer desk where you will be directed to the relevant office which will look upon your request. The application will require you to state exactly the type of your sign, a sample of the sign, a permit from the local authorities and a down payment as the sign is being processed. The company will send a few personnel to your business place and critically examine correct position where the sign will be installed to capture the intended potential clients. Like any other company following legal formalities, after completing the work the client will pay the balance left outstanding. However, your recommendation is always important as it credits our reputation and reviews. Installation is done using all methods necessary to put the sign at a precise position. If the sign is intended to be installed on the surface of the building, our team of experts uses high tech equipments that will allow them reach the position chosen. We also consider risks of damaging your property especially at high vertical extended buildings. To minimize this mess, the experts are able to select the best and most appropriate equipment to support them and the sign during the installation process. Best results are achieved through coordination and team work among our personnel. For the best signs types reach us today and you will never regret.